If scaring people is your game then Chompo is the name! You are sure to be the creepiest dude on the block in this Scary Chompo the Clown Mask. People will undoubtedly cross to the other side of the street when they see you coming while wearing this molded latex mask, don't take a personally clowns just get a bad wrap. Especially a creepy clown such as Chompo. 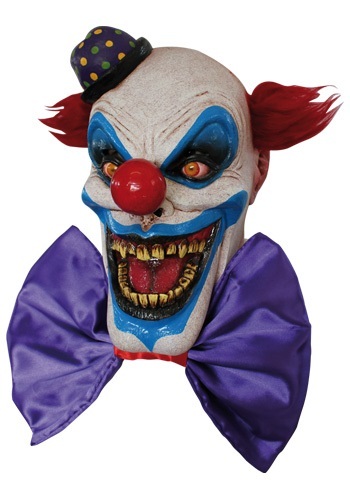 This scary Chompo the Clown Mask bears a strange resemblance to the Joker. I mean if the Joker had a brother, let’s say an older one, Chompo would be it. They both share a come near me and I’ll rip the skin from your face look. It may or not be the creepy tufts of red hair, yellow uneven teeth or the fact that this mask covers your entire face so nobody will know whos underneath. All we know is you are sure to give anyone who comes near you a scare. This mask is great. Very scary when all dressed up!